Eweka provides an excellent service. Eweka is our preferred Dutch Usenet carrier. They were chosen based on their excellent completion rates, impressive retention and thanks in no small part to its low price. They have recently added a Newsreader. 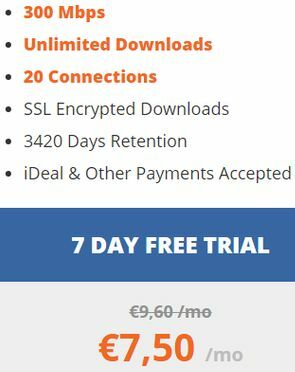 The main advantage of Eweka is its competion rates: Eweka is a Dutch Usenet provider based in Alkmaar, Netherlands so Eweka is under jurisdiction Dutch law (NTD procedure). Generally, it is better to sign up for Usenet service providers based in Europe because European based servers are not subject to US DMCA laws, but they are subject to NTD requests. Based in the Netherlands helps to maximize completion rates because DMCA'd content today is typically removed in less than 48 hours time. For NOTD it can take much longer - up to 5 days - to remove files. And DMCA requests are much more frequent than those of the NOTD (NTD-behavioural code). So Eweka is a TOP choice if completion rates is your top priority. In fact, one would be hard-pressed to find a Usenet provider with a better completeness rate. Binary Retention: Eweka currently has 3,880 days of binary retention. The great advantage of Eweka is their retention equivalent to the best Usenet providers in the US and double the retention rate of pretty much any other Dutch providers. A provider’s retention period indicates how long a file will be available for download after it was originally posted. In other words, with Eweka you can access files that were uploaded to Usenet in 2009. 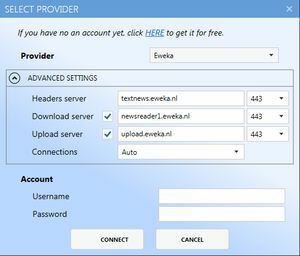 Newsreader: Eweka offers Newslazer, a free newsreader to its users. It is fast and reliable. Newslazer has a friendly interface and allows you to search and download files with ease. It also allows the users to automate the downloading. Good completion rates makes downloading from Usenet easy. I recommend Eweka for anyone that doesn't want to worry about completion.... Generally Dutch providers are particularly good when it comes to completions. I rarely get incompletes since I started using them. Its completion level for the most recent posts is very good. I have downloaded many old files (years old) without any issues (Its 3,750 day retention lets Eweka users search for old indexed files). You can test Eweka for 7 days to test their completion. Newslazer newsreader is easy to use. Newslazer has easy setup all you have to do to enter your username and password, and you are good to go. NZBGeek NZBGeek is a Newznab indexer that also uses manual NZB referencing (obfuscated releases) from its members. This is probably the best place to find what is interested in Usenet. NZBPlanet It is also a great NZB indexing site with quality items (obfuscated releases). DogNzb It's one of the best NZB indexes these days but this site doesn’t give out offers for registrations often. 6Box 6Box offers a generous free membership. The site’s allowed Unlimited NZB downloads! Newslazer should automatically associate your downloaded NZB files, and begin downloading them when you open them. That’s all there is! Well done you’ve downloaded your first file from Usenet. 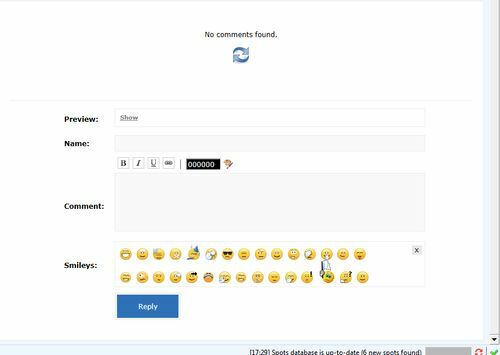 Spotnet 2.0 is decentralized Usenet community based on the Spotnet protocol. In our experience Spotnet is the best NZB Sites alternative. When you have filled out the information, SpotNet will retrieves the oldest Spots' first. After a while (depending on your internet connection speed, your usenet provider speed and your database speed) it will catchup and start showing recent spots. Now you can start using it to download movies, series and music from Usenet. Using spotnet is easy. or thanks to a search engine. We downloaded the classic 1968 horror movie Night of the Living Dead (public domain). Spotnet 2.0 uses internal downloader for downloading, repairing and decompressing. Please post a small thanks and rate their spot when using a spot by one of the spotters to acknowledge their hard work. If you combine Eweka with the Spotnet protocol, you are all set. 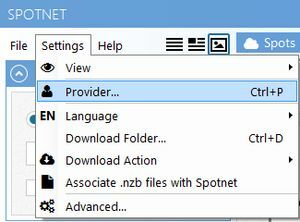 With Spotnet you can search and download in one program.